Every time I post on autonomous trucks, I get dozens of emails from people telling me that self-driving trucks will not happen for at least 10 more years, if ever. People cite insurance, driving skills, city traffic, changing road patterns, faulty radar, etc. My typical reply is things will likely happen far faster than even I envision. And so here we are, at least a year before I thought possible (but 15 years before some naysayers thought). TruckYeah reports Freightliner Just Revealed The First Real Road-Legal Autonomous Big Rig. Wired reports World’s First Self-Driving Semi-Truck Hits the Road. License plates are rarely an object of attention, but this one’s special—the funky number is the giveaway. That’s why Daimler bigwig Wolfgang Bernhard and Nevada governor Brian Sandoval are sharing a stage, mugging for the phalanx of cameras, together holding the metal rectangle that will, in just a minute, be slapped onto the world’s first officially recognized self-driving truck. The Freightliner is still very much a test vehicle. 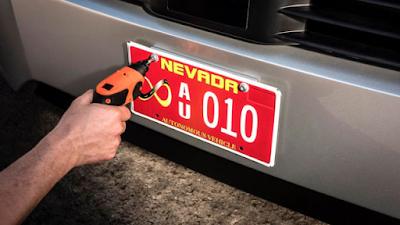 Daimler’s confident it’s safe for public roads, and the Nevada DMV agrees. But the automaker needs a few million more test miles on the books, in a wide variety of locales and conditions (snow, rain, extreme temperatures), before it’s ready to offer even this very limited autonomous capability to any customers. That’ll take a decade. That’s partly because long haul trucking is not an especially pleasant job, and because it takes time and money to earn a commercial driver’s license. The shortage will get worse, Perry says, thanks to a suite of regulations set to take effect in the next few years. A national database to collect company-performed drug and alcohol tests will make it harder for drivers who get in trouble at one job to land another. Speed limiters could keep trucks to a pokey 64 mph. Mandated electronic reporting of hours driven will make it harder to skirt rest rules and drive longer than allowed. These are all good changes from a safety perspective, but they’re not great for profits. The way to handle that growth isn’t to convince more people to become long haul truckers. It’s to reduce, and eventually eliminate, the role of the human. Let the trucks drive themselves, and you can improve safety, meet increased demand, and save time and fuel. The safety benefits of autonomous features are obvious. The machine doesn’t get tired, stressed, angry, or distracted. And because trucks spend the vast majority of their time on the highway, the tech doesn’t have to clear the toughest hurdle: handling complex urban environments with pedestrians, cyclists, and the like. If you can prove the vehicles are safer, you could make them bigger, and thus more efficient at transporting all the crap we buy on Amazon. It should be perfectly obvious to everyone now this will not take a decade before such technology is mainstream. What's tested now will be routine two or three years from now. When I first started writing about this, most thought we would not get to the testing stage until 2020. Please compare my thoughts from October 4, 2013: Never Has Arrived; The Last Mile to the section on "Killing the Human Driver" from Wired. Wired says "The Freightliner is still very much a test vehicle. Daimler’s confident it’s safe for public roads, and the Nevada DMV agrees. But the automaker needs a few million more test miles on the books, in a wide variety of locales and conditions (snow, rain, extreme temperatures), before it’s ready to offer even this very limited autonomous capability to any customers. That’ll take a decade." No it won't. Daimler says that to ease the fears people have of self-driving trucks. And once the safety record is proven, there will be no need for a backup human driver at all, at least for the highway.